Société Réaliste, Universal Anthem, 2013. Performance view, Szabadság tér, Budapest, April 26, 2015. Photo: Aknay Csaba, the Orbital Strangers Project and OFF-Biennale Budapest Archive. Hungarian artist Ferenc Gróf and French artist Jean-Baptiste Naudy make up the Paris-based artist duo Société Réaliste. On April 26, 2015, the group organized a performance of Universal Anthem, 2013, which Gróf describes here as a “parody of contemporary musique concrète,” for the OFF-Biennale Budapest. As Gróf describes below, the event was performed with a brass band in front of a controversial monument. Gróf will also present a lecture-performance in Budapest on May 13, 2015, during the Former West conference. The OFF-Biennale Budapest runs through May 31, 2015. WE COINED SOCIÉTÉ RÉALISTE as the name for an unrealized exhibition that would have analyzed parallels between contemporary art and socialist realism, which was the official artistic style of the former Soviet Union and its satellite states. It was not meant to focus on the former Soviet countries but to excavate some of their underlying algorithms that are related to the ideologies of contemporary art. When we started this collaboration more than ten years ago, it was the high time of relational aesthetics, especially in Paris. So our practice was meant to be a kind of critical relational aesthetics, analyzing how economics, politics, and language modify or influence contemporary art. For Universal Anthem, we developed software that can calculate the average of any number of musical scores, note by note. We created a database of the national anthems of the member states of the United Nations, ran it through the software, and then worked with a composer to clean up the result, which is almost unplayable by any human. The score is a parody of contemporary musique concrète—Stockhausen on LSD. Our goal is to deconstruct one of the main national symbols. It’s a vandalist attitude, but sometimes criticism itself is more pertinent than proposing a new construction, or a bright new future. It was important for us to play Universal Anthem right now in Hungary because of the country’s recent nationalistic tendencies and its anti-Roma, anti-Semitic, ethnicist discourse of the last few years. The performance took place in Budapest’s Szabadság tér, or Liberty Square, where last year the government erected a monument to the victims of the German occupation. For many, the monument symbolizes a denial of the Hungarian state’s responsibility during World War II and the Holocaust. The organizers of a countermonument, the Living Memorial, have been demonstrating against it since then, a kind of sustained protest that has never before happened in Budapest. 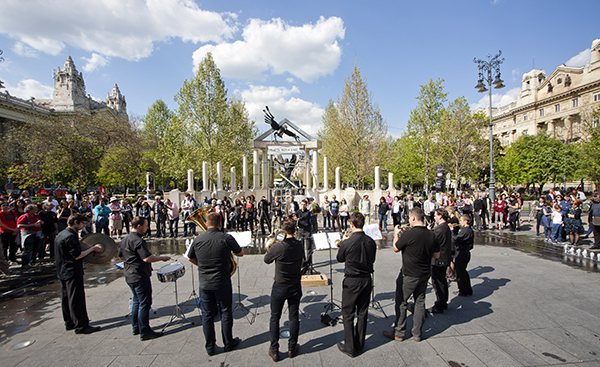 They invited us to perform Universal Anthem with a brass band in front of the two monuments as part of the OFF-Biennale Budapest. The performance was a great moment with great coincidences. The organizers of the Living Memorial explained to me how to position the audience around the border of a fountain that is in the center of the square, which temporarily shuts off the fountain, so the noise wouldn’t overpower the musicians. The musicians stood in the middle of the audience. It was very powerful with the kitschy monument behind, the police circulating around, and this usually very loud, but now silenced, fountain near the musicians. Right now I’m researching some of the cultural icons of central Europe. For the Former West conference, I will present a sequence of graphic works titled Švejk in the Third World War, 2015. It is an imaginary continuation of the Czech writer Jaroslav Hašek’s novels The Good Soldier Švejk and follows Bertolt Brecht’s 1943 sequel play Schweik in the Second World War.